The Local Kitchen & Tap: Located onsite in The Local Kitchen & Tap. It is just what you are looking for to unwind from the day! Childrens's program - We have an outdoor swimming pool onsite. Kennedy Space Center, Jungle Adventures & Zoo, River Lanes Bowling and Sand Point Park are nearby. Indian River Banquet Room: With 1500 sq. 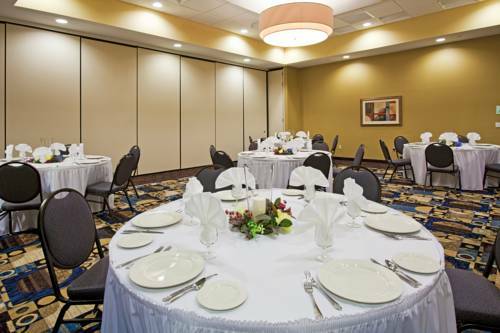 ft. of flexible function space named the Indian River Ballroom, the hotel will also be available for a variety group meetings, banquets and special events. Kennedy Space Center Visitors CenterThe Kennedy Space Center Visitor Complex is the visitor center at NASA's Kennedy Space Center in Florida. It features exhibits and displays, historic spacecraft and memorabilia, shows, two IMAX theaters, and a range of bus tours of the spaceport.